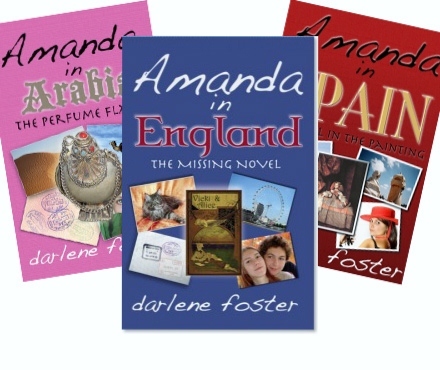 I would like very much to introduce to you a lovely friend and fellow writer/dreamer Darlene Foster, an author of the Chapter book series, Amanda in Arabia, Amanda in Spain, and the new, Amanda in England. 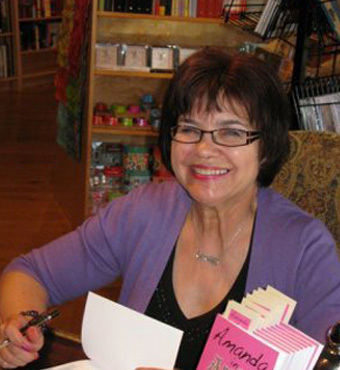 Darlene is a published children’s author, an employment coach/facilitator, an ESL tutor, a wife, mother and grandmother. Like me, she loves travel, shoes, cooking, reading, sewing, chocolate, music, the beach and making new friends. Her grandson calls her “super-mega-as woman-supreme”. She was brought up on a ranch in Southern Alberta, where she dreamt of traveling the world and meeting new people. She lives on the West Coast of BC with her husband Paul and two black cats, Pumpkin and Monkey. Darlene has been visiting my blog for some time and I was delighted to find she is a fellow dreamer as well as a lover of travel. As writers I think we all are dreamers of sorts and I especially loved her travel stories, which have brought back wonderful memories for me. Darlene I see from your website, your books are inspired by your travels, when and for how long did you visit England? D: My first trip ever on an airplane was 35 years ago when I flew to England to marry my dear husband. We were there for a month that time. We have been back a number of times as my husband is from England and his family is there. So I have been able to explore it a lot. It is almost my second home. How long after visiting England was it before you actually started writing “Amanda in England” or did you start straight away or make notes consciously for this story? D: We went to the Isle of Wight six years ago and fell in love with it so I decided Amanda needed to go there. I made some notes but I was still working on Amanda in Spain at the time so I put it on the back burner. As you already have your main character, how do you decide on the situation or adventure for your character? Is it something you saw on your trips and decided to use or just something you made up? Such as the Novel in this book, or in “Amanda in Arabia – the Perfume Flask”, does the flask actually exist? D: It is usually something I saw on the trip. For instance, I own the perfume flask from the first book. I did buy it from a crowded little shop full of amazing things. I also felt it called out to me and that I had to have it. I had no idea it would be part of a book I would write one day. As for the vintage book, I have always loved vintage books and I came across a number of them whenever I visited England. I just knew Amanda would have the same love of books I have always had. How long did it take to write “Amanda in England – the Missing Novel”, compared to the first two chapter books? Was it easier or harder, and why? D: It took me about 18 months to write Amanda in England-The Missing Novel which was quicker than the first two so I guess it does get a bit easier. Or maybe I was just more determined to get the book done. I also have more of a routine now. I make sure I write two hours every evening. From the acknowledgements in the back of the book I gather you did a lot of research, how important do you think it is, to ensure correct names of places, words, and phrases? Is it necessary? D: I do quite a bit of research and try to get it as close to right as I can. I don’t think it has to be dead on but I want children to learn about another part of the world when they read these books. So I don’t want to misinform them. One thing that must be on every writers mind I am sure and that is, did you intend for this to be a series? Did you pitch your first book as the beginning of a series, or just a stand alone? D: I did not intend it to be a series but once I completed the first book I thought, perhaps Amanda should travel some more. I pitched the first book as a standalone initially. I thoroughly enjoyed these three books and wonder what is next on Darlene’s list, is Amanda off on another venture very soon? Did I read a faint hint that her friend Leah may be visiting Alberta next? D: Oh, yes. I have started Amanda in Alberta-The Writing on the Stone. Leah comes to visit Amanda in Alberta. I grew up there so I thought why not write about what I know very well. There is a lot of history and interesting places in Alberta that children (and adults) will be interested to learn about. I know travel is a favourite hobby, but what would be on the top of Darlene’s wish list? I think Amanda would have a great adventure down under, don’t you? Oh I think Amanda would have a great time down under. Tell me what does Darlene do to past the time, to relax – besides writing and dreaming stories? D: I don’t have too much time for that as I work full time as an employment counsellor and part-time as an ESL Teacher. I do like to go for walks on the beach and going for coffee with my best guy as well as spending time with my friends. What does your writing space look like and is it at home, in a cafe or garden… where? D: My writing space is at home in our apartment. We have a spare room/office with a computer in it and piles of books and papers I use for research. When we have out of town guests coming I need a couple of days to sort it all out so they have a place to sleep. Thank you so much for interviewing me Diane, another traveller and dreamer. Synopsis: Amanda is now 13 years old and visiting her friend Leah in England. Getting used to the cars driving on the other side of the road and being in awe of all the historical buildings, taking in the sights by riding on the London Eye (Ferris wheel), the Tower of London and Harrods can be daunting for a young teenager. Seeing a book missing from a collection during a tour Amanda befriends a pair of street wise teenagers and after meeting a strange elderly bookshop owner, getting lost in a maze, and hiding out in the underground, Amanda sets out to find the missing novel. I loved Darlene’s series, and as I have gotten to know Amanda during the first two books, Amanda in Arabia – The Perfume Flask in which Amanda first met Leah and tried to help an Arabian Princess, and Amanda in Spain – The Girl in the Painting, in which Leah and Amanda find themselves befriending a young girl hiding in their closet. Finally in this latest book Amanda in England – the Missing Novel, her first impressions of London I found were so very much like my own. Darlene cleverly weaves the varying culture and themes within the story and the mounting tension in the adventure compels you to read the novel in one sitting. Having travelled extensively with my husband I have often thought of writing such novels like these for young people so as to share the amazing experiences I have had. I also love that on Darlene’s website there is a back story about Amanda, the typical teenager keeping in touch with her friend Leah with emails, and Facebook, and earning pocket money for her trips. I look forward to hearing more of Amanda’s travel experiences in the future. 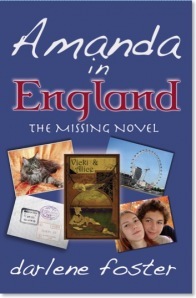 Come join Darlene as she will be showcasing her new book, Amanda in England – the Missing Novel, this Saturday at Albany Books in Tsawwassen, October 20th, from 1:00 – 3:00 pm. She be reading from the novel and signing copies of all three of her books. Thankyou so much Darlene for agreeing to be interviewed and allowing me to post a review of your books. This entry was posted in Interviews, Travel and tagged Darlene Foster. Bookmark the permalink. I know just the kids I’d like to get these books for. Thanks Diane and Darlene. Great interview! Nice to meet Darlene. What a great idea to have Amanda’s back storyback story on your website. That would be fun to create & fun for Amanda readers to visit. It is a great idea, thanks Penny! Thank you for the wonderful interview Diane and the encouraging review. Nice to meet you Julie and Penny, thanks for your comments. Your very welcome Darlene, it was lovely to have you here. Oh yes, Carol. They will be visiting Drumheller and the dinosaur museum for sure! Thanks for your comments. Thankyou Carol for commenting, I hope you will come again. These sound like the kinds of books I would have LOVED when I was younger…or even now. Great interview, Diane. I grew up reading the Bobbsey Twins and their travels which I loved. I am hoping children now still like to hear about other countries. Many adults are enjoying these books as well which makes me very happy. Thanks Carrie. I totally want to read Amanda in England. A bit of nostalgia for me. Thanks ladies! I’m so impressed you have time to write, Darlene. There’s a lot of prep in ESL. Do you make time to write when you have guests. I find it so hard. It is indeed difficult to find time to write when I have guests but I do try to squeeze in some time. My family and friends understand how important it is for me to write. Thanks for your interest in Amanda in England Catherine. Hi Nancy, I’m sure Darlene will try and fit it in…lol. Amanda (and Darlene) would love to visit Colonial Williamsburg. We know just the right person to show us around!! Fantastic interview, and good to learn more about Darlene and her wonderful books. Her books sound interesting, and children are always interested in other parts of the world, so I think they would be a great read for them -fun and educational all rolled into one – perfect!. I live in Australia, and think Amanda Down Under would make a very interesting book indeed! Hi Barb, wouldn’t that be great having Amanda down under. They are lovely books full of adventure. Thanks so much for commenting. Australia and New Zealand are high on the list for sure. Thanks Barb for your comments. It was great to learn more about both Darlene and Amanda! I know I’m going to enjoy this book! I’m sure you will Beth! Thanks Beth. I do hope you enjoy the book. I’ve just read and thoroughly enjoyed Amanda in England, and the other ‘Amanda’ books are on my ‘must read’ list. Darlene is a lovely lady, and I enjoyed finding out more about her. Thankyou Barbara. Darlene is a lovely lady and I have enjoyed sharing this with you. I need to get Amanda in England now! I really enjoyed all of Amanda’s other adventures! Thanks Erik. I think you will like this one, especially Rupert the cat. Hi Erik my mate, nice to see you here. These will be great for your sister later on. Enjoy! What a fun interview! I haven’t read these books- but they do sound great. I enjoyed hearing where Darlene got her ideas from and I love that she thinks of England as her second home. I would love to travel there! Thanks for sharing. Thankyou Jess, so pleased you liked the interview and enjoyed hearing about Darlene. Pop back anytime. Thanks Jess. Diane did make the interview fun by asking great questions. I hope you get to England one day, I know you will love it.